QT. Bank reserves. Balance sheet normalization. They really are going through all the motions in 2019. It’s as if officials can sense something just isn’t quite right. This would amount to a serious setback, of course, having assured the public repeatedly how the financial system has been remade into “resilient.” Janet Yellen, call your current office, Jay Powell’s Federal Reserve isn’t quite so sure anymore about that whole bank crisis thing you said. It’s hard to gauge whether it is mainstream thought that is evolving, or merely the form of its continued stupidity. Nothing ever stands still in this world, but that doesn’t always represent progress. The Federal Reserve’s Vice Chairman for Supervision is Randall Quarles. He also chairs the Financial Stability Board. Both are resume-padding devices, filling out required requirements about pedigree. Thus, his opinions on monetary matters are given great consideration regardless of their content. Occasionally we hear that banks feel they are under supervisory pressure to satisfy their [high-quality liquid assets] with reserves rather than Treasury securities…. that’s not the case… I don’t think we should have an official preference for reserves. What he’s really trying to say is that bankers are telling him, and presumably FRBNY, that they are worried about the level of bank reserves. The Fed is reducing that level as it winds down its four prior QE’s. As assets runoff the asset side of its balance sheet, unless something offsetting is done the remainder on the liability side, bank reserves, must fall by an equal amount. In official training, a bank reserve equates to what Milton Friedman once called “high powered money.” It’s hard to make that argument today simply because no one, outside of a bank comptroller, has ever seen one. You can’t walk into a grocery store and walk out again with food in your hands leaving behind only bank reserves. They’d call that stealing, maybe counterfeiting, too. It is, quite simply, an accounting entry. It is one form of liability which banks may use to “fund” their balance sheet activities. That’s it. There were practically no bank reserves before the depths of the 2008 crisis; the US dollar system quite literally didn’t need them. This global eurodollar design redesigned what counted for “reserves.” Practically any bank liability will suffice, which is why there is such a demand for what banks can, but no longer want to, create. These other forms of reserves were imaginative and dynamic, compared to the stale inertness of what central banks deliver almost by accident. 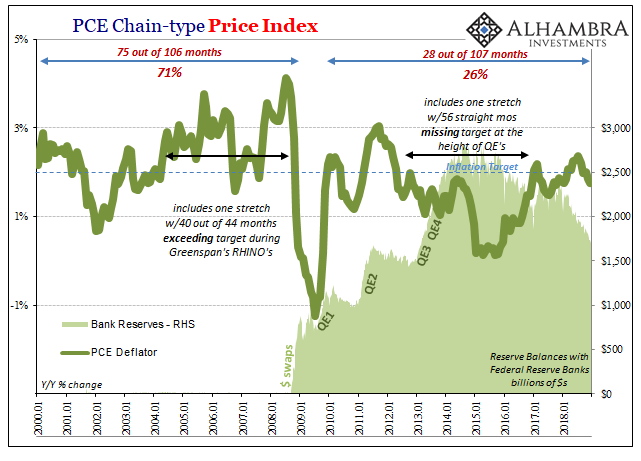 QE’s were meant to play upon expectations, that was their big purpose. In terms of operative money, at best an asset swap. But that’s no longer how officials want to play this. They can’t because, again, something just isn’t quite right. There is palpable monetary tightness in the US dollar system that not even these boom guys at the Fed can deny. It must be regulations, then. Basel III, among other showy things, required banks to submit to what amounts to a modern stab at a reserve requirement – this LCR, or liquidity coverage ratio. To satisfy the LCR, the big banks must hold, unencumbered, a sufficient stock of HQLA, or high-quality liquid assets. The LCR itself works like a capital ratio, a flashy amalgam of byzantine calculations compiled in such a way that you never actually think or ask questions about them.